Welcome to the new Holiday Inn Express Hotel and Suites Eau Claire/Chippewa Falls, our 100% smoke free property. Located on I-53 at the intersection of I-29, midway between Eau Claire and Chippewa Falls WI. 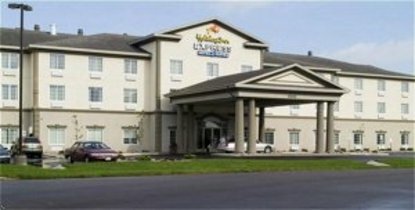 The Holiday Inn Express Hotel and Suites Eau Claire/Chippewa Falls is just minutes from many leisure attractions and corporate locations such as Silicon Graphics, Cray Research, Leinenkugel's Brewery, Kell Container, Marshfield Clinic, Irvine Park, Casper Ball Fields and Country and Rock Fest. The hotel is also conveniently located 3 miles from the Chippewa Valley Regional Airport.Start your day with our complimentary Smart Start breakfast bar, featuring our signature cinnamon rolls and hot entree selections. Workout in our state of the art fitness center or unwind in our heated indoor pool and whirlpool.Built in 2007, our Holiday Inn Express Hotel and Suites Eau Claire/Chippewa Falls reflects the most current and contemporary design. Each guest room features, free high speed wired and wireless Internet access, 32 inch LCD flat screen TVs , expanded cable and HBO, micro/ fridge units, and free local phone calls. Our on site meeting planner can assist in making your next meeting for up to 30 guests a success. The Holiday Inn Express Eau Claire/Chippewa Falls represents hospitality and service second to none in the Chippewa Valley This hotel is committed to providing accessible facilities under the American Disabilities Act. If your accessibility needs are not met, please contact the Hotel Manager on Duty. Should you require additional information regarding accessible facilities for guests with disabilities, please call 1-800-Holiday (U.S. and Canada) or contact the hotel directly. For the hearing impaired, TDD service is available at 1-800-238-5544 within the U.S. and Canada.